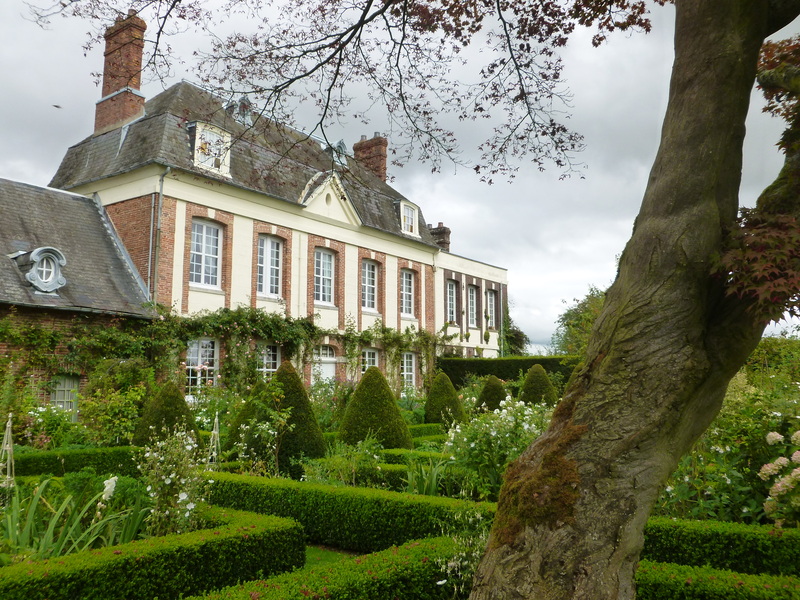 Les Jardins d’Angélique surround a 17th century manor house near Rouen where the owners, Gloria and Yves Lebellegard, created their garden in memory of their daughter Angelique. 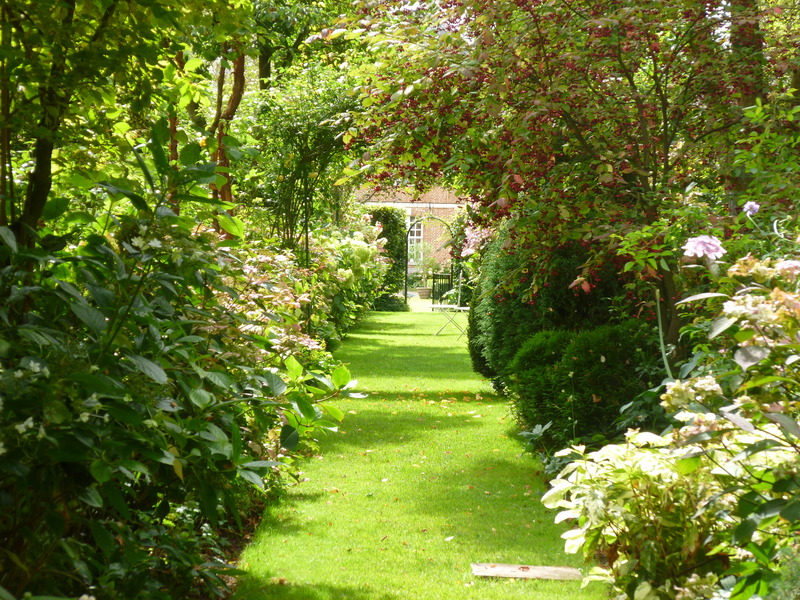 The grounds are divided into two gardens of quite different styles. To the north of the house sits a woodland shrubbery with a Second Empire or Victorian feel, the garden to the south has a more formal Italianate style. 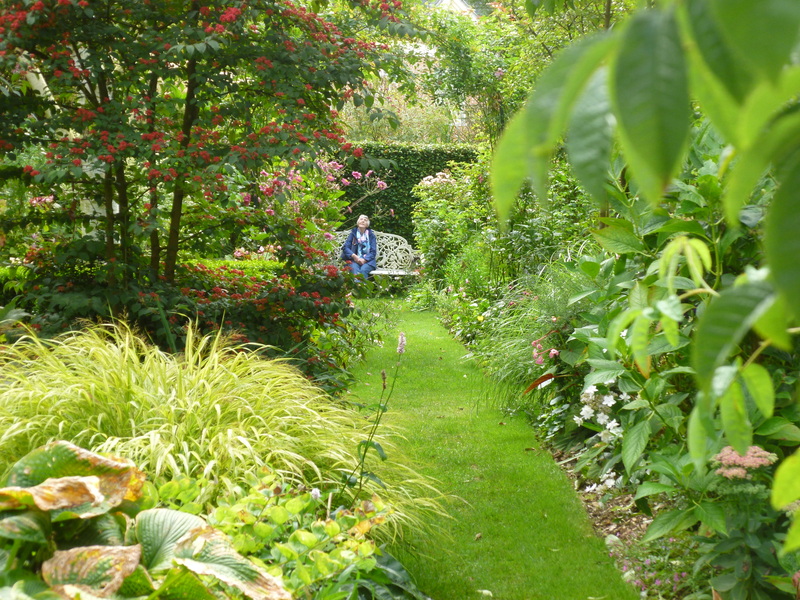 Beyond the wide sweep of lawn and through a gate in a tall beech hedge sits an informal and romantic woodland garden with grassy paths and many specimen trees and shrubs. 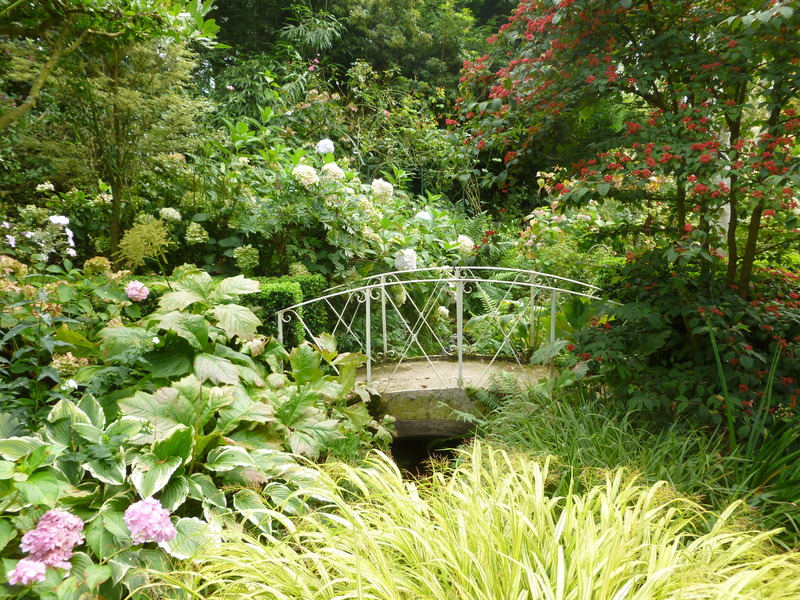 A stream trickles through the garden, crossed by small bridges and feeding shady pools. 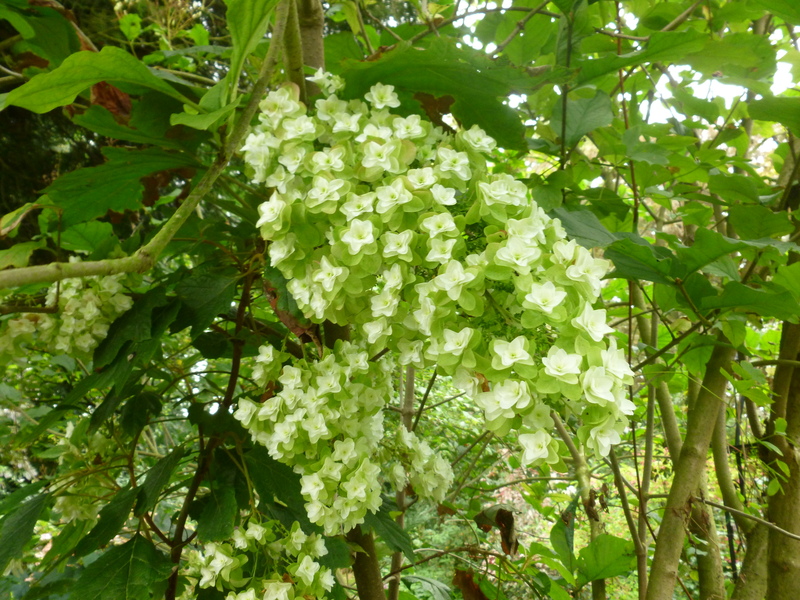 In September the garden is full of flowering hydrangeas, fruiting euonymus and virburnum. 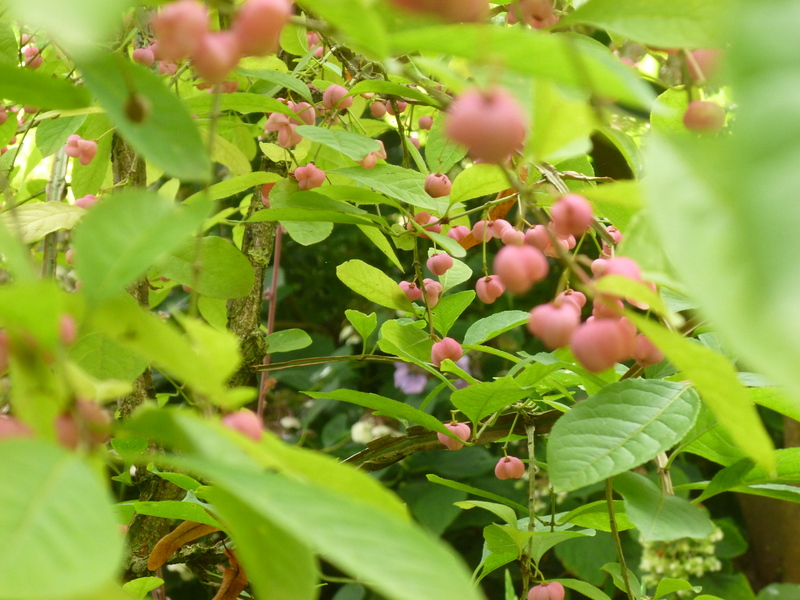 Overhanging the bridge, the red fruits of Viburnum plicatum ‘Pink Beauty’. 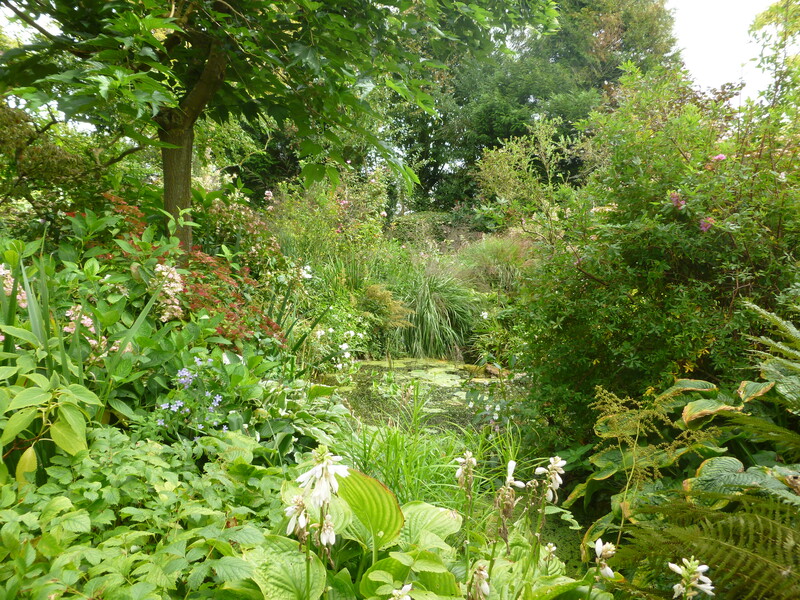 One of the small ponds, densely surrounded by marginal plants. 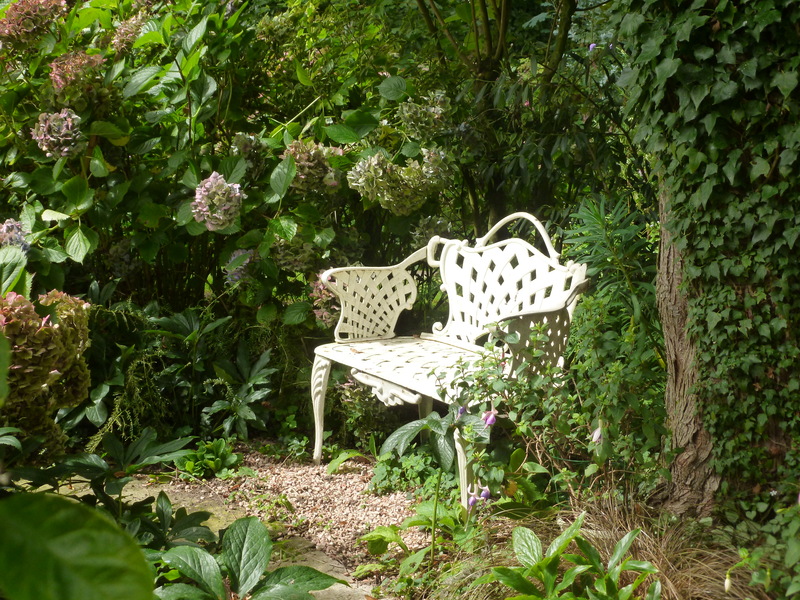 Throughout the garden, the owners have placed benches at focal points and in spots where one can sit and just enjoy the atmosphere. These white-painted iron benches also add to the Second Empire feel. 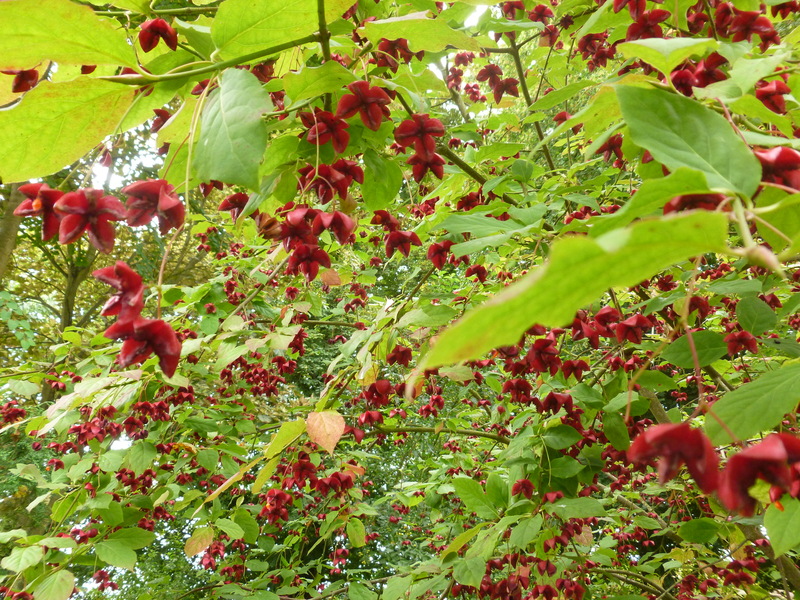 During my visit, the many fruits and flowers of the roses, trees and shrubs were very inspiring. 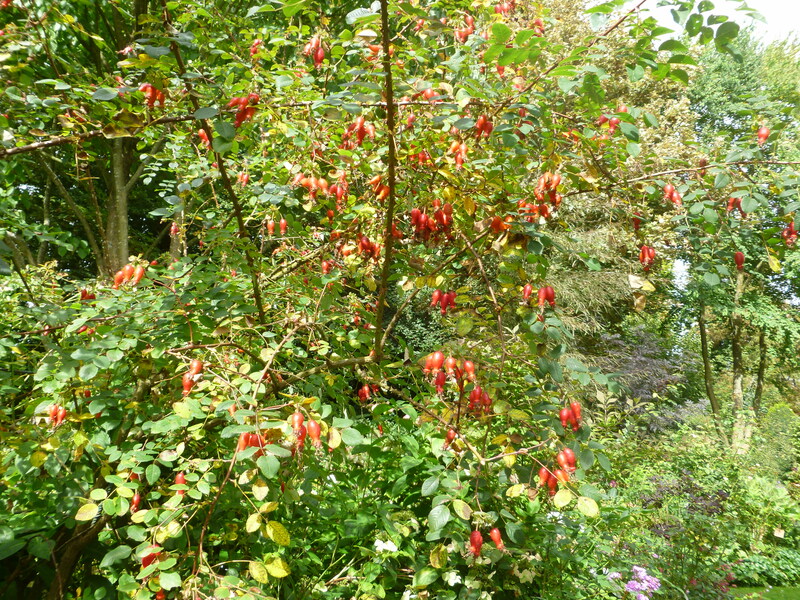 The glorious red flagon-shaped hips of Rosa moyesii. Behind the house, facing south, lies another garden quite different in style. A splendid stone fountain combined with clipped yew topiary, rectilinear box parterres and a white and green colour palette, give it a formal Italianate feel. 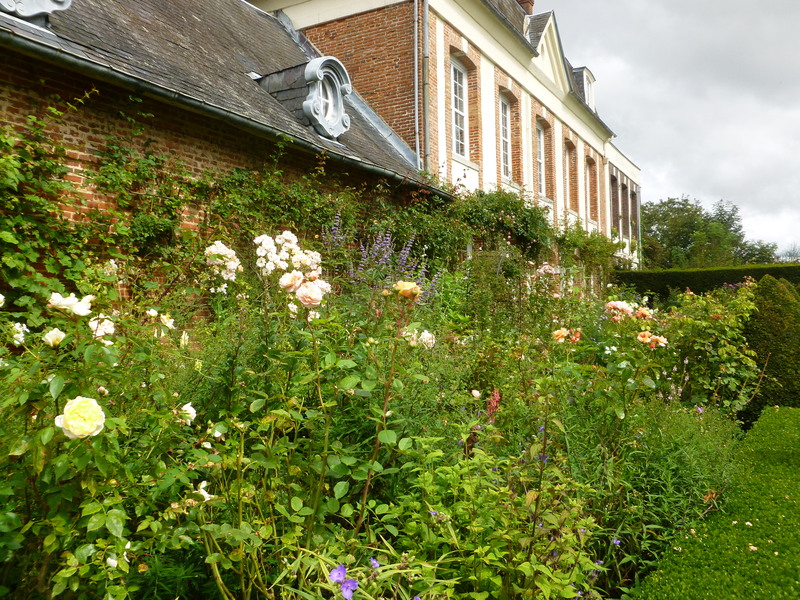 Within the box parterres, the planting is freer and dominated by roses and perennials. 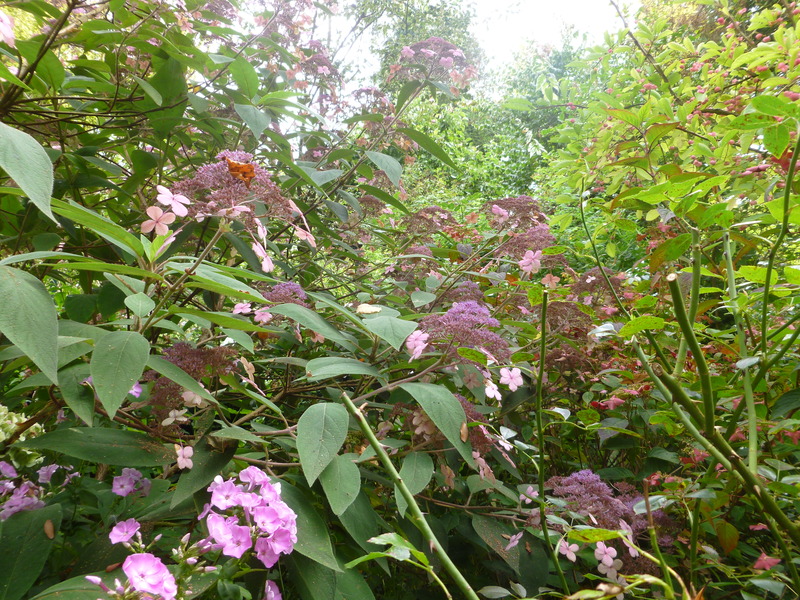 To the centre the colour palette is white, moving to blues and peach tones towards the house and garden edges. A wide border full of roses and perennials lies up against the house. 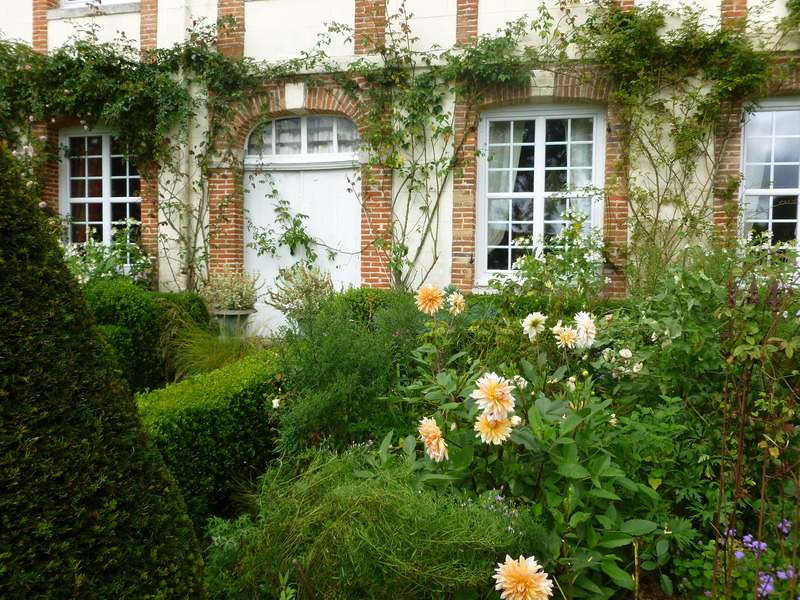 There is a lovely contrast between the topiary, the clipped box hedges and the exuberance of the roses and perennials. The peachy pink tones of the flowers also reflect back the warm colours of the brickwork. A leaning Japanese maple adds character to the formal parterres. The sound of trickling water adds even more atmosphere to this very romantic garden. These two gardens, though different in style, are both beautifully maintained, have strong structures and are full of interesting plants. 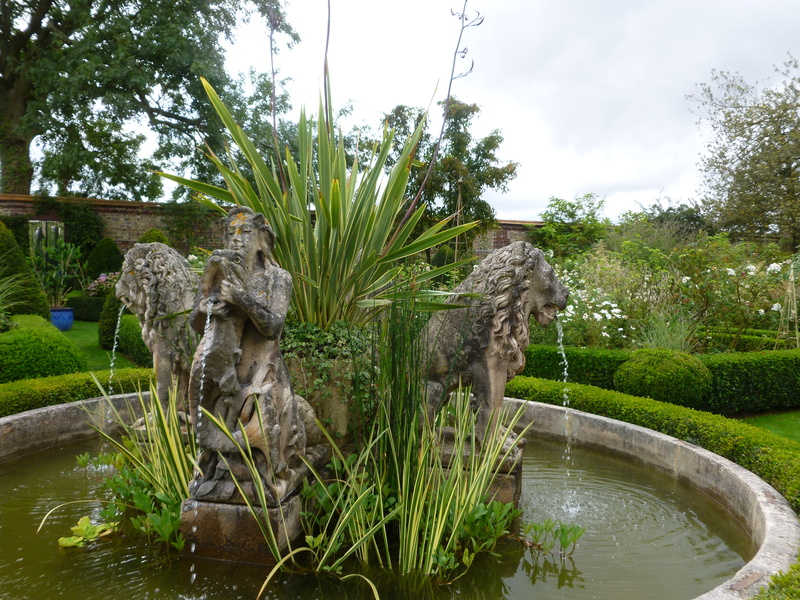 Beautiful features such as the ponds, bridges, antique benches and fountain make for an interesting and inspiring garden to visit. 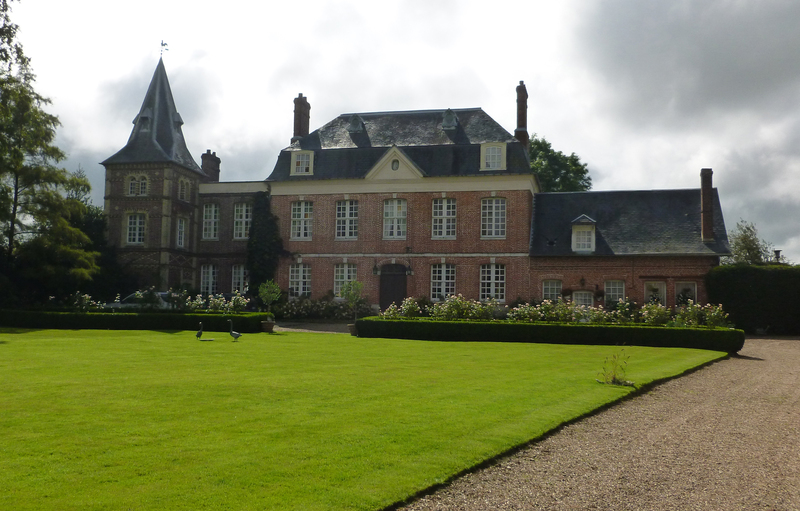 Les Jardins d’Angélique, Route de Lyon, Montmain, 76520 Rouen, France. It’s best to call in advance to check opening times as these vary. English is spoken. 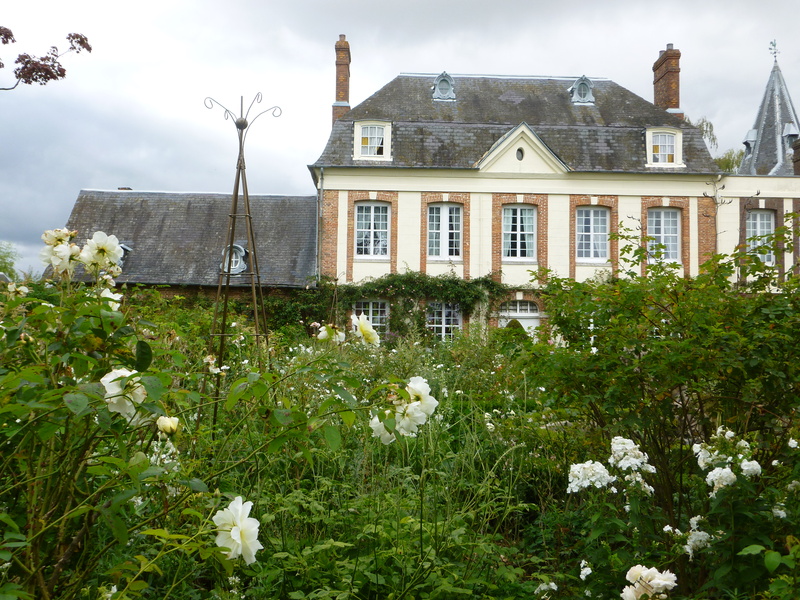 I visited the gardens whilst assisting Susan Worner on her excellent tour of Normandy gardens in September 2014. For more information go to Susan Worner Tours. 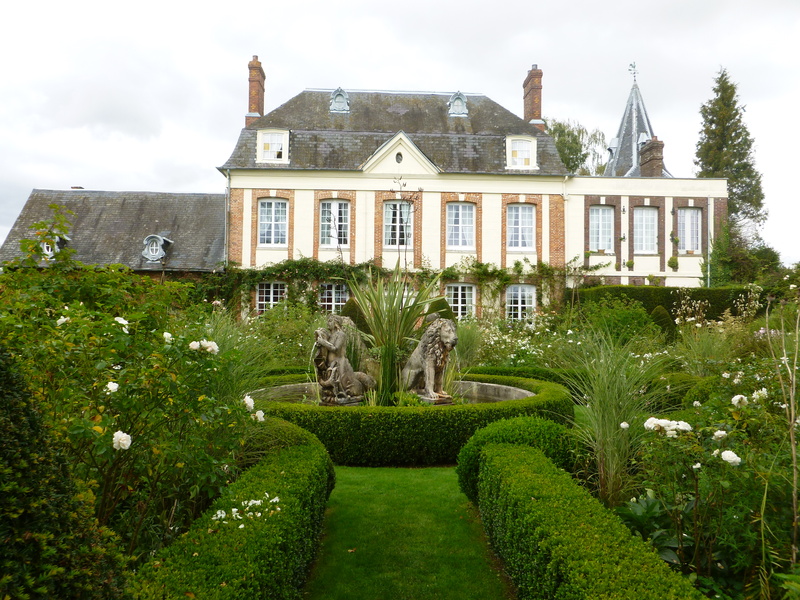 For my list of French gardens, where I get there. A month in England this summer.